You pilot an arrowhead-shaped vessel at the bottom of the screen, facing off against four different types of enemies in the familiar vertical space-shooter motif. Certain enemies drop “space soldiers” when shot if these make it to the bottom of the screen, they will try to “spear” your ship from behind. This is a four-stage space shoot-em-up game. 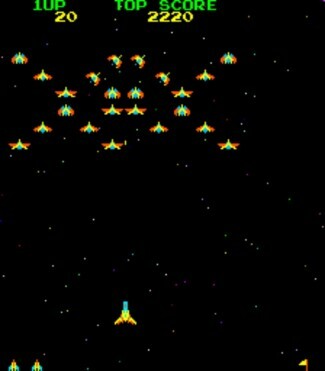 Stage one is a familiar Galaxians-type scenario, with your ship facing off against a formation of super mosquito aliens that break off and dive at you. Completing this stage warps you to stages two through four, where your ship is positioned an inch or two above the bottom of a screen, just above a dotted blue line. This line serves no purpose during stage two’s “hovering attackers”, but during stages three and four “flying bones” and “rolling fire”, the enemies drop Stick Aliens that look like little space soldiers. The Stick Aliens try to get behind the dotted line, where they patrol back and forth underneath your ship, trying to spear you from behind. The only way to get rid of them is to shoot the Killer King which randomly appears during the stage. Completing these three levels warps you back into space, to start the cycle over again.